For almost 10 years, Hublot has been committed to a world in which women and men participate equally in economic, social and sporting life…Progress and innovation are written in the feminine form as well as in the masculine form. On February 4, 2016, the Womanity Foundation’s gala dinner saw Jean-Claude Biver—via video link—convince the audience to invest in a cause particularly close to his heart. The patriarch looks after his employees as well as his family and he praised the qualities and values of women, of which there are, moreover, many at his side. Commitments, partnerships and ambassadors are the messengers that enable a brand to affirm the projects that it holds dear and the fundamental values for which it is prepared to fight. Among the projects that Hublot has supported for several years is the Womanity Foundation, an organization devoted to the emancipation of disadvantaged women and girls. This engagement aims to empower them, thus giving them the keys to their independence and their future. 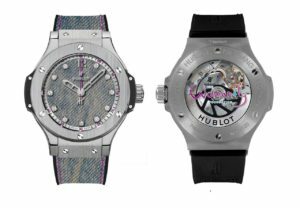 For the occasion of the charity gala held in Geneva on 4th February, Hublot created two individually numbered limited editions of 100 pieces. They use the Foundation’s signature purple while their sapphire glass features its logo. A women’s model clad in jeans and enhanced with diamonds. 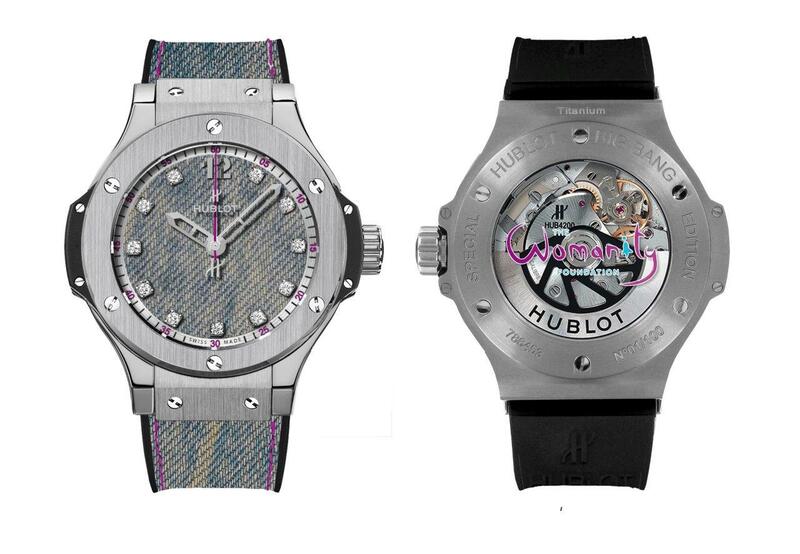 In a stainless steel 41-mm case, the Big Bang “Womanity” is clad in jeans. Its dial is set with 11 diamonds. The second hand and the figures on the counter are highlighted in nuances of mauve. Its strap is clad in jeans on black rubber and purple stitching. At its heart lies the HUB1110 self-winding mechanical movement. A more masculine looking piece that will also appeal to women. A 44-mm diameter chronograph entirely sculpted in carbon fiber—from its case to its bezel via its dial. The tip of the second hand, the figures on the counter on the flange and its strap in black alligator sewn onto rubber all feature a touch of purple. The 44-mm Big Bang “Womanity” houses a HUB4100 self-winding chronograph movement with its 42-hour power reserve.